time for a cup of something? Exam finished, pick me up, Got time for a cup of something? As ever, my first thought was “no time”. It’s a tray of plastic cups from the ubiquitous Swedish furniture store. We must have at least a hundred of these at our church for the kids to have water in, and it feels like nearly that many at home! Anyone else out there prepared to admit to having bought three sets in order to avoid the argument about who gets the pink one? 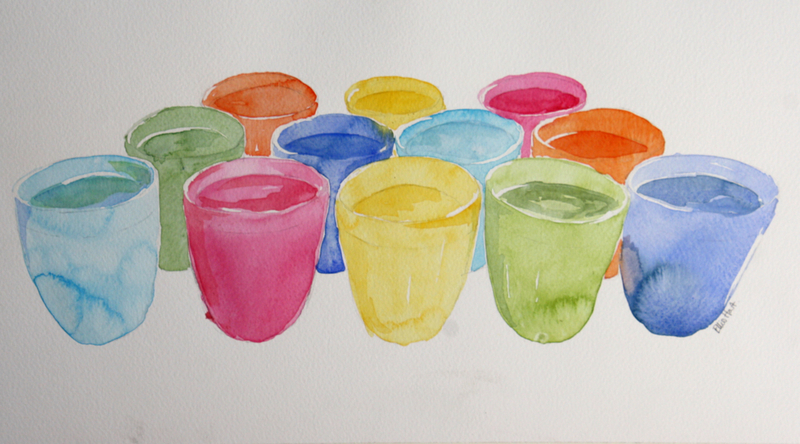 I’ve only painted a few, but in the picture God showed me, there were many, many different coloured cups, all with something slightly different in them. And one of those cups is for you. It’s a cup of blessing, and sometimes blessing comes with laughter, sometimes with tears. It might be comfort for your pain, it might be a lesson learned, it might be uncontrollable joy bubbling up from underneath the stone floor you’ve carefully laid in place. It might be any number of awesome, beautiful, wonderful, precious things. I don’t know. But I do know that it will be good. It might not be the same as yesterday’s; it might not be what he has promised for tomorrow. It might not be what you think you need right now; it might not look like an easy cup to drink. It might look so good that you think it can’t be for you, that he can’t possibly want to pour out blessing for you after everything you’ve done. I don’t know whether, like me, you will just think “No time”, and never make it to take the cup he is offering. Don’t be too tired or too busy. Don’t be so caught up in the urgent that you miss the important. Whatever reason you have for not taking the cup God has for you today, don’t let it be “I just didn’t get around to it”. But what I do know, beyond doubt, is that he has a cup for you. Whether or not you call yourself a Christian: a son or daughter of the king; there is a cup of blessing from the Father with your name on it. You can’t put in an order for the particular kind of blessing you want, and you can’t exchange it for another one. But if you want it, it’s there. Waiting. As I write these sentences, I’m listening to an instrumental version of the hymn ‘I surrender all’. Sometimes… often… accepting my cup for today is an act of surrender. I’d rather have someone else’s… A little girl inside me is still yelling “I want the pink one!” 🙂 And often I get the pink one, and sometimes I look back and realise I got something better. If you can make time today, even a few minutes, ask the Father what cup he has for you today. Then take time to recieve whatever he has to give you. Make time, come, surrender, and drink… it will be good. How about if this week, every time you see a coloured plastic IKEA cup, you asked God “What cup do you have for me today” and then took a moment to listen to and respond to his answer? He had a beautiful cup for me today that was to be poured out for someone else. Love it! Talking about cups……… Shall we purpose to arrange to have a cup together soon??!! I know you have visitors from the UK. Soon after they leave? Bless you dear Ellie and keep them coming. PS. Any news re publisher? Would love to have a cuppa soon. No news re: publisher yet. We shall see! Your painting skills make even ikea cups look aesthetically pleasing! So funny. I led a wonderful time of devotion at work today and played ” I surrender” as the introduction. That (the call to lead devotion and be who He created me to be at my work) was my cup for today and I was so glad I drank from that. Thank you. You’re absolutely right – there’s a big difference between the urgent and the important. But the urgent has such a loud and convincing voice … and leads us into all kinds of trouble as a result … Great post, as always. It’s a simple thing to choose our own cup and drinking preferences but quite another to ask the Father what He would have for us this day. Left to my own devices I would probably pick the cup of energy, strength or joy. However, God might want me to continue drinking from the cup of pain and sickness in order to learn more deeply how those things make us cry out to Him, draw us closer to His presence, and learn how to be more compassionate toward others.